Chinese people do not feel they must choose one religion or philosophy and reject the others. Four religions and philosophies are particularly important for them. These are: Confucianism, Taoism, Buddhism and the popular or folk religion Feng Shui or Geomancy. An important feature of Chinese religions is the conception that every force exists in an opposition, that for every force there is an opposite force by which it is made whole. Thus the female principle “Yin” is completed by the male principle “Yang”. Polarity occupies a very important place in Chinese thought, such as that of light and dark, hot and cold, wet and dry, hard rock and soft soil. Yin is associated with negative forces: darkness, passivity, water, heaviness, the moon, rain, odd numbers, earth, winter, cold, tigers, the depressed side of human nature and the female; Yang with positive forces: light, activity, air, lightness, fire, the sun, sunshine, even numbers, heaven, mountains, summer, heat, dragons, the energetic side of human nature and the male. “Yang” expresses the meaning of perfected humanity and life itself. The Yin, corresponds to human feelings, and Yang, to human nature. The Yin -Yang philosophy was extremely influential. Yin and Yang are the fundamental forces in nature, society and the individual, two opposing yet complementary energies and harmony on earth can only be created when there is balance and harmony between Yin and Yang. There is a part of Yin in Yang and a part of Yang in Yin. Confucianism, Taoism, and Feng Shui seek to harmonize the Yin and Yang energies. This simple dualism is represented most prominently in a book, edited in Han times, called the I Ching, the ‘’Book of Changes’’, a kind of fortune telling manual. According to a very doubtful tradition, I Ching was edited by Confucius, has exerted influence on Chinese writers for over 2000 years as a result of its inclusion in the Confucian canon. Change is constant, simple and easy, and whatever issues from it is good. In certain respects, change to go in cycles, leading to the development of society, morality and civilization. The word ‘’spirit’’ in the book denotes not spiritual beings but natural forces. 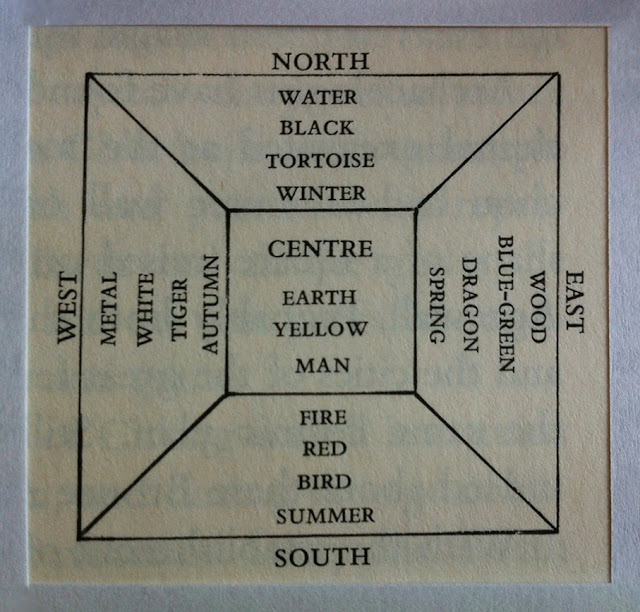 Important as yin and yang, equally powerful is the set of ‘’Five Activities’’ named Water, Fire, Wood, Metal and Earth. These, like the yin-yang dualism, appear first in books of the fourth and third centuries BCE. 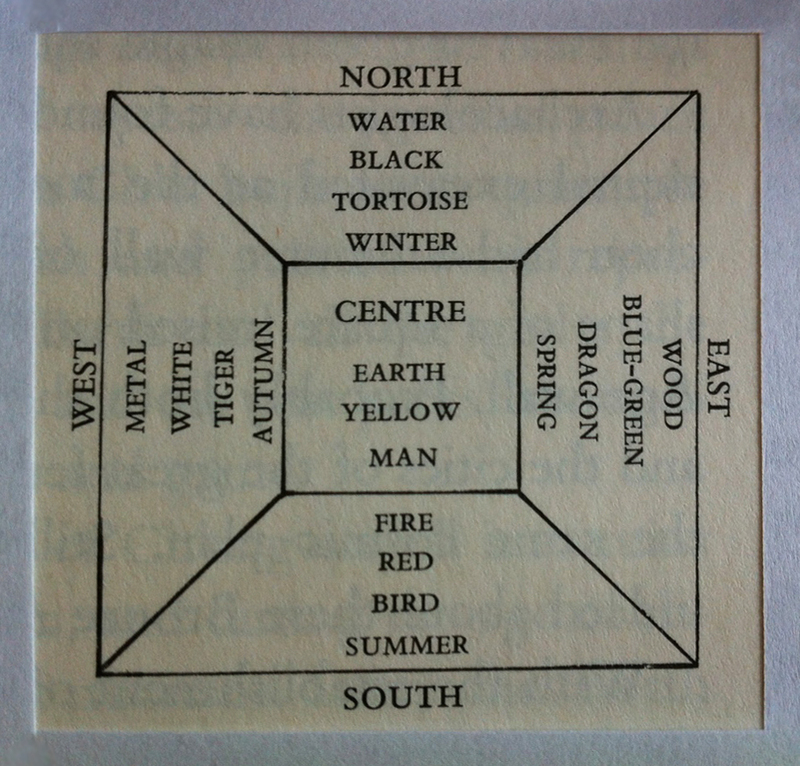 The Five Activities were associated with the five directions, the five primary colours and the five sacred animals. The four seasons were assigned to four of the Activities, Earth being excluded because it represented all seasons. Feng Shui is a blend of Chinese mystical beliefs, folklore, astrology, astronomy, the study of topography, knowledge of human actions, animal symbolism, numerology, knowledge of the Five Activities and Chinese wisdom. Some applications of Feng Shui are designing and decorating homes, deciding the dimensions and positioning of buildings and landscape planning, in order to activate good luck and to enhance business success and so on. The tiger, the dragon, the black turtle and the crimson phoenix make up the four celestial animals of Chinese mythology. The turtle, a celestial animal, is symbolized in landscape, by protective hills behind a house. According to the Feng Shui experts, Hong Kong is fortunate in its natural surroundings. The hills behind the city serve as protection and are very auspicious. In the garden of Huaqing Hot Springs, a favoured resort of Tang dynasty emperors. 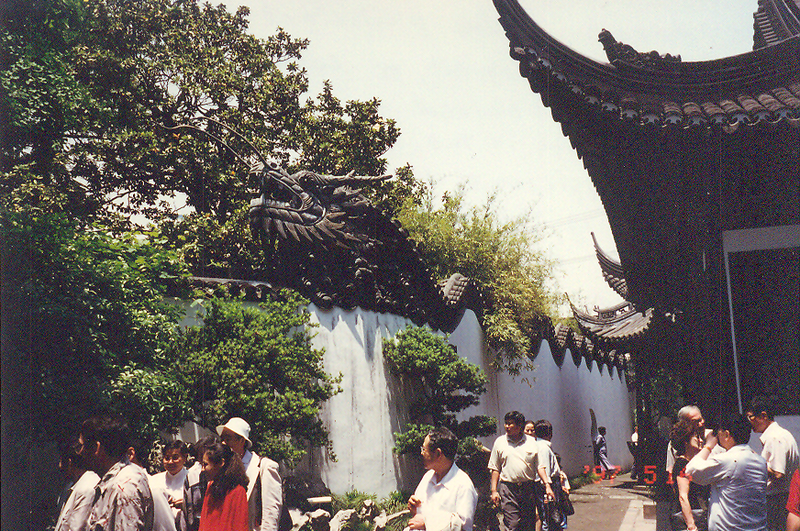 The dragon is the principal symbol of Feng Shui. The spirit, or cosmic breath, of the dragon is believed to influence natural forces intangible in the environment, which translate into auspicious and inauspicious luck. The symbol of the dragon is associated with the emperors of China and is a sign of strenghth, goodness, and male fertility. Sites imbued with the dragon’s cosmic breath are areas of abundance and prosperity. Imperial dragons have five claws. The rain spirit of the ancient Chinese was also the dragon, the sacred symbol ofthe East and the ‘’gatherer of the clouds’’ whose beneficence was essential to a rich harvest. Enamelled tiled dragon motif from Mandarin Gardens, Shanghai. Longevity and good health, which is represented by bamboo, pine trees and cranes, which are often depicted in Chinese art. Peaches also symbolize longevity. The lion is the symbol of protection and stands on guard at the entrances to all of the main halls of the Forbidden City, Beijing. Many temples and houses also have pairs of these protective lions. Lions must be placed outside and never inside. 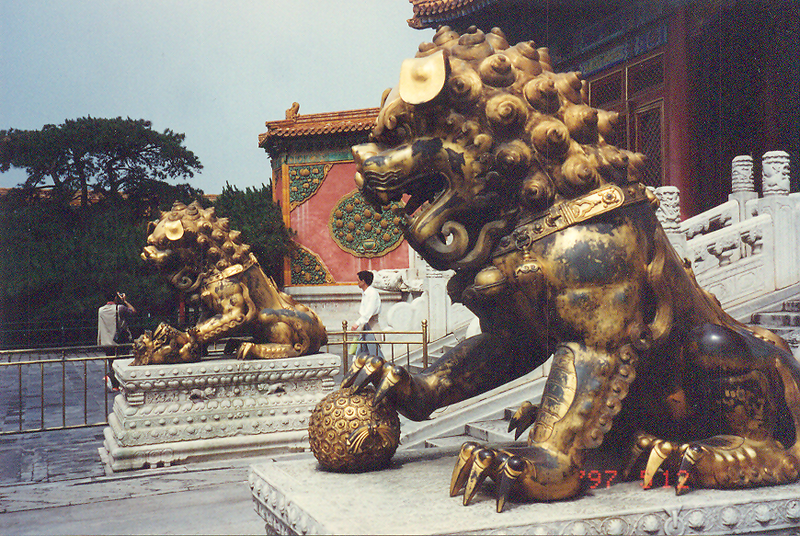 Here a golden lion guards the entrance to the former Imperial Palace in Beijing.